Today we’re excited to announce that the beta program for our Data Privacy Management Platform has reached full capacity. Numerous well-known international brands have signed-up to participate in this program, which will give them access to this comprehensive and intuitive privacy solution. The interest we’ve seen since announcing this program is a strong indicator that enterprises are eager to invest in privacy by implementing privacy compliance tools, and also highly value the opportunity to become privacy leaders within their respective fields. 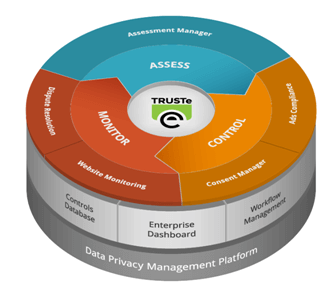 The TRUSTe DPM Platform is a comprehensive privacy management solution. The beta program features the latest module of the DPM Platform, the TRUSTe Assessment Manager module, which provides automated capabilities to assess and manage privacy risks including compliance reviews, gap analysis and program management. The beta period runs through the end of December, during which time the participating companies will provide feedback about the platform. General availability for the Assessment Manager Module as part of the TRUSTe DPM Platform is expected this December. “This beta program is a great opportunity for companies who want to be early adopters of a solution that can help them to keep pace with the evolving privacy and regulatory landscape, and for TRUSTe to gain some valuable insights for further development of the platform,” says TRUSTe CEO Chris Babel. Privacy has become a key focus for organizations that wish to address growing consumer concerns and minimize compliance risk. According to a recent survey of 1,000 Chief Privacy Officers conducted by the International Association of Privacy Professionals (IAPP), privacy spending for the Fortune 1000 is expected to approach $3 billion in 2015, with 38% of respondents indicating an estimated increase in budget of 34%. This signifies major growth in the privacy sector and validates that a real need exists for solutions that help privacy professionals manage these needs across their organizations. To learn more about the DPM Platform, read our latest press release or visit our website. To request a demo, contact TRUSTe at 1-888-878-7830.